This entry was posted on January 7, 2012 at 6:00 am and is filed under Barack Obama, Economy. You can follow any responses to this entry through the RSS 2.0 feed. You can skip to the end and leave a response. Pinging is currently not allowed. I don’t believe this chart – I am a republican but looking for honest answers not [deleted by moderator due to profanity] I GET ENOUGH OF THAT ALL DAY LONG LISTENING TO THE DAILY NEWS. Which chart don’t you believe? The first one that comes from the Federal Reserve or the second one that comes from the Bureau of Labor Statistics? Which is to say that BOTH charts are as official as it gets, and if you don’t believe them why not just pump your brain with the MSNBC Kool Aid flavor of the day? Please don’t tell me you’re a Republican. You’re not; you’re one of the numerous dishonest liberal swine I encounter every day who pretend they’re “objective” as opposed to the rabid little demoniacs they truly are. No, rather than admitting that you are a liberal – and yes you SHOULD be ashamed for being a liberal – you want future readers to falsely believe that here you are, a REPUBLICAN for crying out loud, and I’m just so far outside the mainstream it’s not even funny. Bullcrap. You’re not a Republican; you’re far too STUPID to be a Republican. Yes, these are honest charts. Both of them are official charts from the best official sources to compile them. The problem is that YOU’RE not honest, not that the charts aren’t. MY sister has been unemployed now for 2 and a half years..Her life has been destroyed. Thanks Obasta*d.
I haven’t watched it in years, but there was a show on called “Married with Children.” It was about a completely dysfunctional family. I can’t believe this. How dumb do you have to be to overlook the simple fact that the length of unemployment is naturally going to increase when a recession starts (before Obama took office) and will fall at some time after the economy recovers. If this kind of simple math escapes you, it is no wonder that you’ve worked yourself up into the rabid foaming-at-the-mouth state of hatred that your writing reveals. We are CONSTANTLY LECTURED every damn day that when Obama took office, we were losing 750,000 jobs a month, but that it’s all better now under Obama. HOW DUMB DO YOU HAVE TO BE TO OVERLOOK THE SIMPLE FACT that no recession has ever lasted forever and that things invariably reach an equilibrium – which is to say that Obama has NOTHING to be boasting about, does he? So right back atcha, you dumbass. That said, there is a reason that whereas your Obozo crap above is crap, my point about unemployment is valid for SEVERAL reasons. Reason number one is because hypocrite dumbasses such as yourself constantly tell everyone who will listen how terrible things were under Bush and how wonderful a job your messiah Obozo is doing. But that just aint true on virtually ANY measurement you want to compare (including this one). Reason number two is that – hey, DUMBASS! – your messiah and your messiah’s mainstream media propaganda keep telling everyone that the recession is OVER. And this dreadful length of unemployment wasn’t taken a year ago or two years ago when Obama was failing; it was taken THIS FREAKING MONTH when Obama is STILL failing. We are now into the fourth year of Obama’s presidency and things are crappy. The simple fact of the matter is that you are the intellectually retarded hater who isn’t smart enough to comprehend that. Pleeaassee People! Theres jobs out there! Waa..waaa…waaa…my sister cant find a job! My 16 yr old son just found a job and so did 3 of his friends so maybe u all should stop sitting around complaining u can’t find a job and go look! Quit blaming Obama.. Theres work out there! Oh.. And as far as your ” charts” do u know how many fake charts I’ve seen.. Everywhere!! The all look legit and are either manipulated to look good or bad for the President. It depends on who’s tryn to make a point! You’re right. Everything’s going marvellous right now. Better than ever. The Ministry of Truth would never lie to us. Don’t believe that millions of jobs have simply VANISHED under Obama. Don’t believe that if we used the SAME labor participation rate today as we did when George Bush left office unemployment would be 11.4 percent now. Don’t believe that 88 million working-age Americans have simply dropped out of the job force altogether. 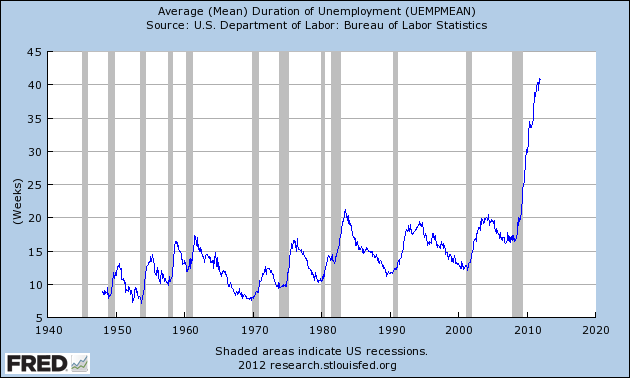 Don’t believe that workers are unemployed more than TWICE as long now as they were when Obama took office. Don’t believe that Obama’s budgets have been so incompetent and so evil that not even a SINGLE DEMOCRAT would vote for his budgets in TWO YEARS. Your 16-year-old son got a job? Congratulations: good thing he’s not a college grad or he’d be SCREWED under Obamanomics. Thanks to Obama, the college graduate employment rate is the highest it has been in America in well over forty years. George Bush had 52 consecutive months of job growth – the longest streak in US history – to go with 6 consecutive years of economic growth and (GDP) growth by more than 17 percent (a gain of nearly 2.1 trillion dollars). And people JUST LIKE YOU DEMONIZED HIM ANYWAY, KRISSY. Please don’t be yet another abject hypocrite liberal who says how dare you do to us what we did to you.